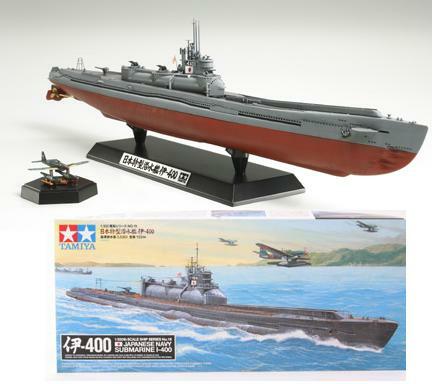 TAMIYA 78019 JAPANESE NAVY SUBMARINE I-400 (1/350)! High-quality 1/350 scale assembly kit model of the I-400 submarine. Accurately reproduced hull features two-piece construction with upper and lower hull sections. Hangar hatch may be modeled in both open and closed positions for increased display possibilities. Details such as crane arm and antenna array realistically depicted with precision-made photo-etched parts. Metal parts for propeller screw shafts provide additional detail. Parts are included to allow depiction of the Seiran aircraft with wings in both extended and folded positions. Furthermore, photo-etched parts are used for aircraft propellers and dollies. – Conveniently includes special display base.